This entry is a Bike Hacks classic (originally posted by Bren). Lately I've been eyeballing some repair stands and contemplating building my own. I don't have a real garage, just a carport with a small attached shop area. The shop area has a workbench, but there's just not much room to move. So I'm thinking of building a movable repair stand. Something that I can put up and take down quickly, but also something that can move around a bit. I've got a great covered area in my carport, but no easy hose access for washing. However, I do have 4x4 posts in both the carport and over near the hose. So I'm thinking that this post-mounted repair stand (it is an old link, no more detailed pictures, sorry) might be just the thing for me. It's nice because it uses inexpensive standard hardware and the main body of the stand is easily moved from location to location, provided you've got mounts already installed. 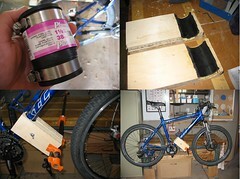 As usual, Instructables has some nicely designed bike repair stands. This one is a really sweet looking bench mounted repair stand, made of PVC. The clamp is very similar to the first version, with a PVC 'T' cut in half and reassembled with hinges and a clasp. The overall design is super simple and ought to be just the thing if you've got a workbench with a little extra room. Here's the second design from Instructables. It's a free standing PVC bike repair stand. This is a pretty clever design that uses no clamp to hold the bike in place. The bike's bottom bracket just rests on the stand. Be sure and read through the comments before beginning this build, since you may require a repair stand with a bit more stability. This wooden bench mounted repair stand looks like a straightforward build. You'll need a workbench and some pipe clamps. This one uses a bit of plumbing polyurethane in place of the foam pipe insulation of the previous builds. Now here's a serious project. This heavy duty bike repair stand is nothing to sneeze at, but if you've got the gear and the welding chops then get after it. This thing looks like a medieval torture device. This fine looking pipe based bike repair stand uses simple and easily obtainable raw materials. The clamp looks a little overbuilt, though I bet you could use one of the PVC clamps from above without much ill effect. The base of the stand uses the same metal flange as used on the first repair stand in this post. This is a really simple design for another bench mounted bike repair stand, and might be just the thing if you've got a workbench. The site has nice plans for the build. This repair stand reminds me of the old hack for using your hitch mounted bike rack on your car as a makeshift repair stand. The idea is pretty much the same. This next one is pretty interesting. I found reference to it in various search engines, but the site was gone. Wayback Machine to the rescue! This design is a freestanding wooden bike repair stand that ends up looking a bit like a miniature gallows. But don't let that deter you. If you've got the wood sitting around, it might be just the thing. If you've got to buy the wood, then you can probably count on not really saving any money over a cheap stand. But then again, cheap stands aren't as much fun as building your own, eh? UPDATE - If you like this post, check out other repair stands posted since! I'm generally a fan of DIY stuff, but in this case I don't see anything here that comes close to matching the functionality of my PCS-9. Since I've had this stand, I've been able to tackle projects I hadn't been able to try before, and I've used every bit of flexibility the stand offers. Moreover, it doesn't take up much space when not in use, and it should last me a long time... which will save me a bundle as I do my own maintenance and repair! If someone simply doesn't have the money, some of these things are decent stand-ins. If you do have the money, I'd urge people to buy the PCS-9 and save money by doing your own repairs/builds rather than skimping on the stand. I've built a very similar version of the first one. I modified it by drilling a hole through the PVC T and the galvanized pipe where they are threaded together and putting a pin through the holes to prevent the PVC T from spinning under the weight of the bike. I drilled a few holes so i could select which angle i want the bike to sit while in the stand. I love this stand and i have built 2 bikes using it and do all my own maintenance with it and I think it cost ~$20 to build. I also executed the drilled holes with a pin idea. It works VERY well and having the bicycle at varying angles is a trick commercial stands rarely do well. After having owned a PCS-9 and having built and used the "post-mounted repair stand" (1st one above) I have to say that there are very few differences that I've noticed in their operation. And you can't beat the price and strength of 1/4" steel pipe bolted to a structural 4x4. I made a portable repair stand with a PA/Speaker tripod, and some black iron pipe. It is light enough to go with me, and can pack up just about anywhere. Holds road, mtb, etc! What is your dream of happiness?What is the passport to happiness? This is something I’d probably up to. I've got some difficulty on repairing my bike, the same issue with my brother. I'm so glad to finally found this site which shares related ideas. I like the way you blog then, for its really detailed. I've learned something about it. Cool blog. Cheers! it doesn't take up much space when not in use, and it should last me a long time... which will save me a bundle as I do my own maintenance and repair! Great! Good way to save space in your garage or even inside your house. And also it is saver for your bicycle from any instances. Very helpful article. Thank you! Looks good,a small space can be prepared as a mini garage to fix your bike.I love my bike because it helps me in exercising everyday.Biking around the village atleast an hour in the morning burns fat. This is something I’d probably up to. I've got some difficulty on repairing my bike, the same issue with my brother. I'm so glad to finally found this site which shares related ideas. I like the way you blog then, for its really detailed. I've learned something about it. *-*I am almost finished with the book!!!! Good idea for my little studio. We have two bikes and always have problem with it. Maybe this was already suggested, but I didn't read many of the previous posts. I am a beginner at home bicycle maintenance and I have low funds to purchase a nice bike stand. I recently figured out that I can use my bike rack on the back end of my car as a maintenance stand. It works really well, you just have to be careful of getting sprays and degreasers on the car. It will do just fine until I can save up for a stand! I have seen bike maintenance racks for lightweight bikes and heavy motorcycles. But I cannot find anything for my new gasoline engine mounted bicycle. I paid $2,000 for this bike and find that so many things have gone wrong, most likely due to the vibrations during use. Things fall off, even a foot peddle that I will have to replace already. The bike itself is heavier than my normal lightweight 24 or so speed road bike. I think the only safe place on it for a bike stand to grab or support is the large beam that runs from behind the handle bars to below the seat post. Are there any heavy duty bike stands that will support in two places of this large beam I mentioned to hold the wheels off the ground so I can perform frequent maintenance? I mount an adjustable trunk mounted car rack on my work bench. Or mount it on the wall. I bought it for a dollar at a garage sale and use the straps it came with for mounting.